Growing Concerns is a tiny environmental awareness organisation which strives to keep things green and simple.....see "GC - About" page. Growing Concerns also restores, recycles & retails antique & vintage garden tools, implements, rustic furniture & allied artworks & artefacts. See "GC - Finds& Retail" page. ​​Growing Concerns is a not-for-profit enterprise and was created and developed by sometime theatre-maker and cultural projects developer, Andrew Kitchen, in 2004. 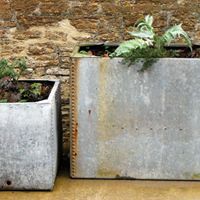 GC also encourages "junk planting" - reusing/recycling artefacts of alternative use as planters - and, where appropriate, community "guerrilla gardening"! On Facebook, Growing Concerns shares eco-news, views and images regarding ventures sometimes large and vital, oft times small and local - hopefully stimulating interest, awareness and even action.